Late model chassis. Engine offset to passenger side of vehicle. Due to clyinder heads (aluminum) generation 6 engines, 502 BB Chevy will have clearance problems on some applications. Bottom of hedder flanges may hit head bolts. Notching may be necessary. Designed for use with a Trans-Dapt throttle body spacer. Does Hedman 69450 fit your vehicle? 69450 is rated 4.0 out of 5 by 2. 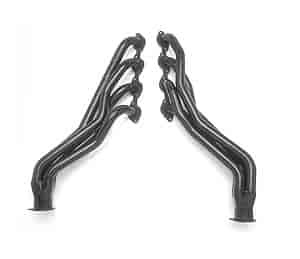 Rated 4 out of 5 by dgkjr from Headers were good quality Bought these for my dually headers fit good no rubbing issues ,good quality no complaints.